After breakfast together, our driver and interpreter, Ahab, came over and we discussed the plans for the day. 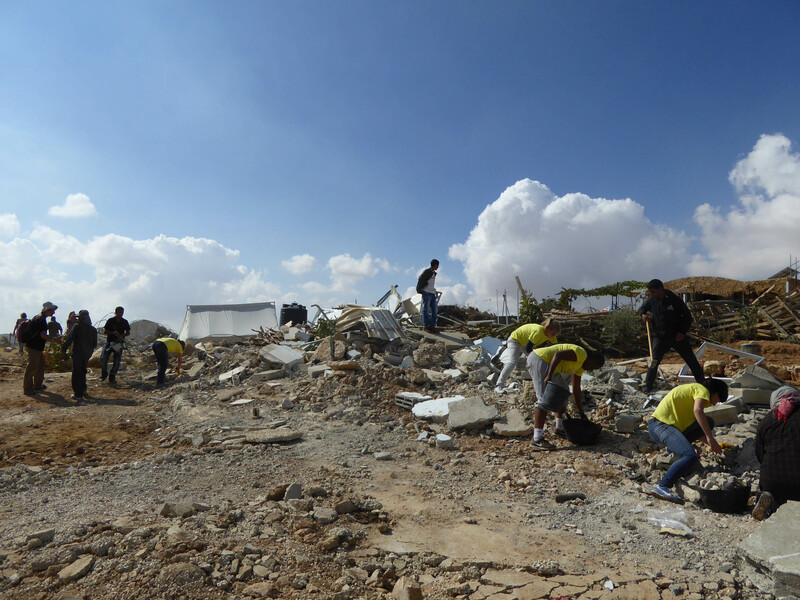 First is a visit to Um al Kher, the village that had the demolitions on Monday. 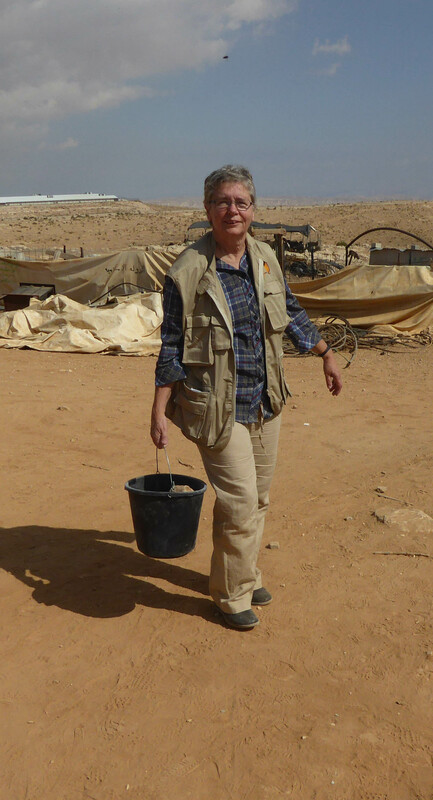 It is a bedouin community that we had visited last week before the devastation. The people in the yellow shirts are the women from the Bristol Football team. The village is very close to the Israeli settlement of Karmel. There they have running water and electricity. 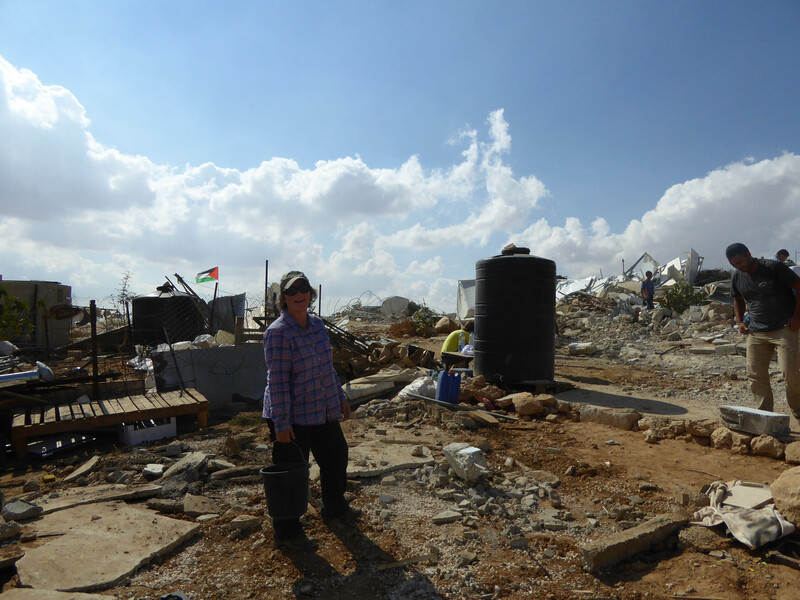 But for Um Al Kher there is very little infrastructure and with these latest demolitions, life will be even more difficult. The Israelis control the water supply in the region and destroyed wells and cisterns belonging to Palestinians. Jan McIntyre is a fellow Canadian and once served as an EA in SHH. Today there were people who had come to help with some clean-up. There was a women’s football team from Bristol, UK who were in the West Bank to promote good will through sports. Also some media and UN personal. We stayed for an hour and a half talking to people and lending a hand with moving stone to build a wall. Please see http://ow.ly/DvC8i The man speaking on the video is Hamud Qawasmeh, a human rights office and wonderful hands on fellow who mobilized those helping in the cleanup. He also is our go-to person when we find out the needs of villages and he can contact the NGO’s who may be able to provide for the needs. This is some of the kinds of things Eid makes from scrape material. After the visit at Um al Kher, we went to Khashem ad Daraj. It is very close to the firing zone 918. From the village we could see Jordan and between also lays the Dead Sea although that is at a low elevation so was not visible. The Israeli government will declare an area a firing zone and then proceed to displace those living in that area. Some of the land too is used by shepherds and they can no longer go there. 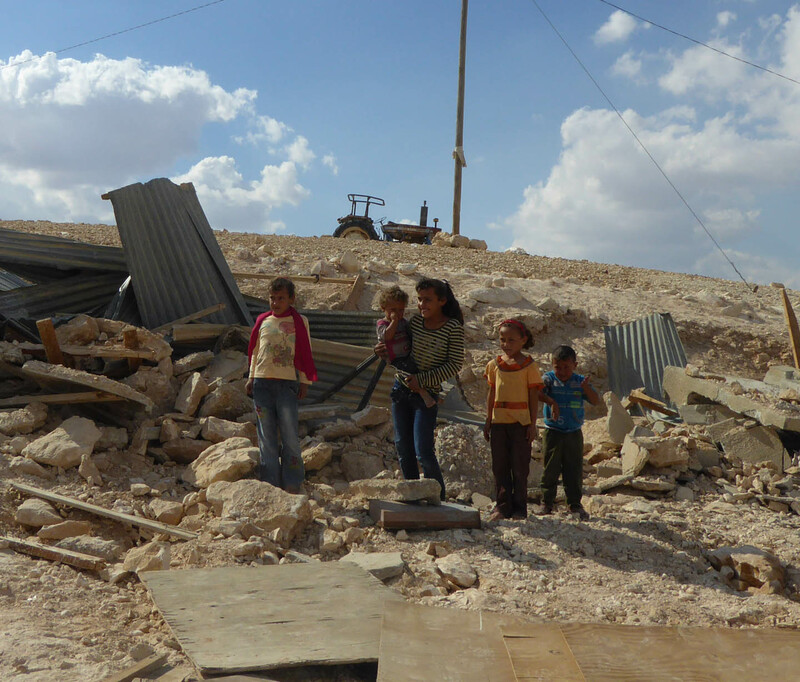 Children on rubble of home. 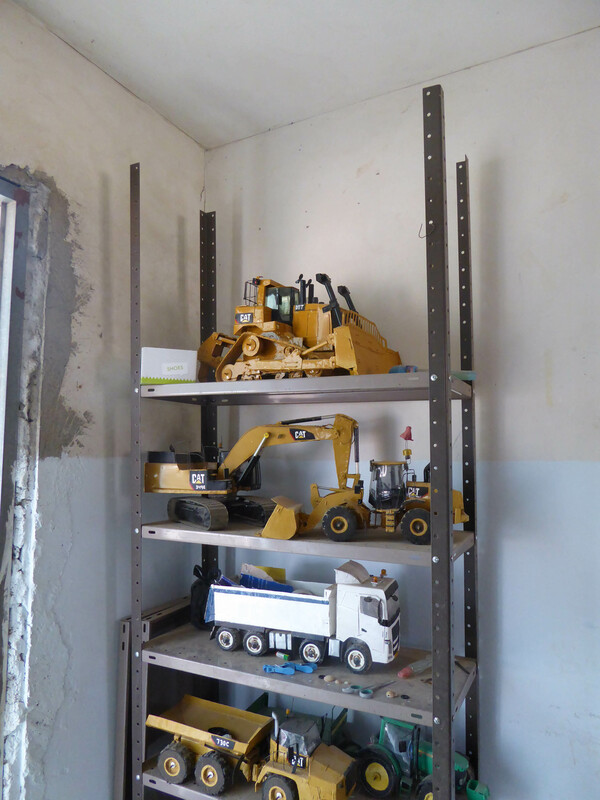 The bulldozers and military were at Khashem ad Daraj the day before and destroyed a cave, toilet, animal shelter and a home. Two children were home when the destruction began and the father stated that they cry at night. Three other children were at school. Imagine coming home and finding a pile of rumble. We made out an incident report. Not sure if it will result in help since it is very remote and cut off. So that was our day. Posted on October 31, 2014, in October and tagged Um Al Kher. Bookmark the permalink. 2 Comments. Continue with the updates, be safe!